It's that time of the week again when my partner and I reveal five of favourite things on a subject. 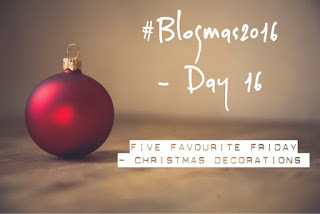 We're keeping to our #Blogmas theme this week, as my partner has chosen Christmas Decorations! It's great how my partner's and my parents differ when it comes to baubles. My partner's family have very co-ordinated baubles, whereas my family have an eclectic mix of baubles from over decades but in my opinion neither is the wrong way to do it, both look amazing. My parents string Christmas cards they receive out across their front room, it's their presence that make me think of Christmas and everyone they know. Its one of those decorations that take me back to my youth, every Christmas Blue Peter would show viewers how to make an Advent Wreath / Crown using sticky back plastic and empty washing-up liquid bottles (or that's how I remember it!). I love that lights now are just on or off when you put them on your tree, you can get those that pulse, flash and even blink to Christmas tunes! Without the humble, and sometimes not so humble, Christmas tree some of the other decorations would end up in a pile on the floor. How sad would that be! My honourable mentions this week go to Tinsel, Foil Garlands and chocolate tree decorations, all could have snuck in to the list, but just missed out today. As always, you can check out my partner's selection here. Its my choice next week, and the final one as part of #Blogmas2016, so we'll see what I've chosen next week!